Marie Powell has been an artist on the Long Beach Peninsula in Washington State for many years. After a 19 year high school teaching career, she now devotes her time to creating her beautiful pastels, oils and mixed media work. 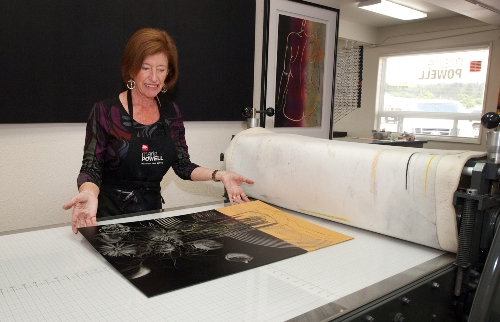 Recently Marie has focused on printmaking, producing vibrant original works of art known as Monotypes. Marie divides her time between the Pacific Northwest of the United States, and New Zealand, and her work is influenced by the people and environments of both countries. A variety of subjects is included in her work, ranging from coastal subjects, floral designs, forest and foliage, and the human form, to total abstraction. Her unique style incorporates strong contrasts, vivid colors, collage, printmaking techniques, and a variety of mediums including oil, acrylic, watercolor and soft pastel. Marie works both in Kerikeri, New Zealand and at the Port of Ilwaco, Washington. She owns and operates Shoalwater Cove Gallery, presently located dockside at the Port of Ilwaco, Washington.